Had a one day heat wave today when it hit 82 after weeks in the 30s. Decided to take the LT for a supper ride only to find the front tire flat as a pancake. I filled it to 42 psi and heard no air leak and a visual inspection showed no obvious hardware in the tread. Bathed the tire with soapy water and found no bubbles anywhere, including around the valve stem. I last rode the bike in early February when we had one reasonably warm day and added a little air at that time. I am hoping maybe it was just a spec of something that kept the valve stem from seating, but that is likely wishful thinking. I will see how much it loses overnight. 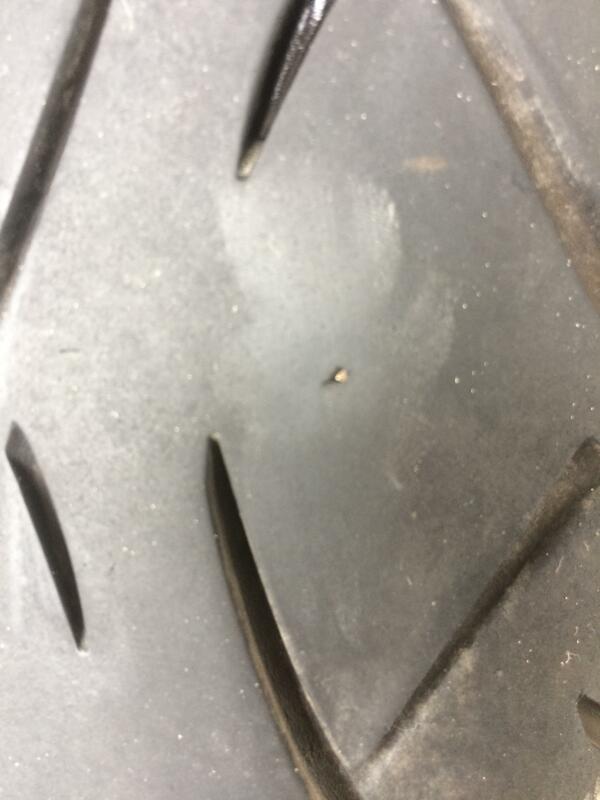 My rear tires have always lost a couple psi every week or two which I always attributed to porous wheels as both my rear wheels do this with both Metzelers and Bridgestones. However, the front tires have always held air wheel. I just hope this leaks fast enough to be evident as really slow leaks can be a pain to find. Anyone know of any good sealants I can try on my rear wheels? It would be nice to not have these slow leaks. I have a compressor with me to pump up your tires in Russellville if needed. My wheels are not porous and hold air pretty well. I do clean the bead surfaces really well when I change tires and have not had any leaks so far. A bumpy start is still a good start if you made it back home. I made it back home as I left the bike home and took the car. Didn't want to risk getting stranded late in the day by a suspect tire. I will check it again today to see how much air is lost in 24 hours. I suspect it is a really slow leak given that I could not quickly find it with a soapy water bath. I have always wished I could find the leak in the rear. The rear has lost air since the bike was new. I have had at least six different tires on the rear (both 880 and 020), two mounted by a tire dealer and four I mounted. At least four different valves have been used, most recently the metal ones from Kurvy Girl. I always wash the rim between tires and scrub the adhered rubber off the bead with a scotchbrite pad. And the beads look good with no obvious scratches or such. No matter what I've done the rear loses at least 4 psi a month. The only common denominator is the wheel itself which is why that is my lead suspect. And the drop center part of the rim looks porous. Sort of like a paint job with really, really bad fish eye. I think I am going to try to find something to seal it with at my next change to see if that makes any difference. Not sure what else to try. 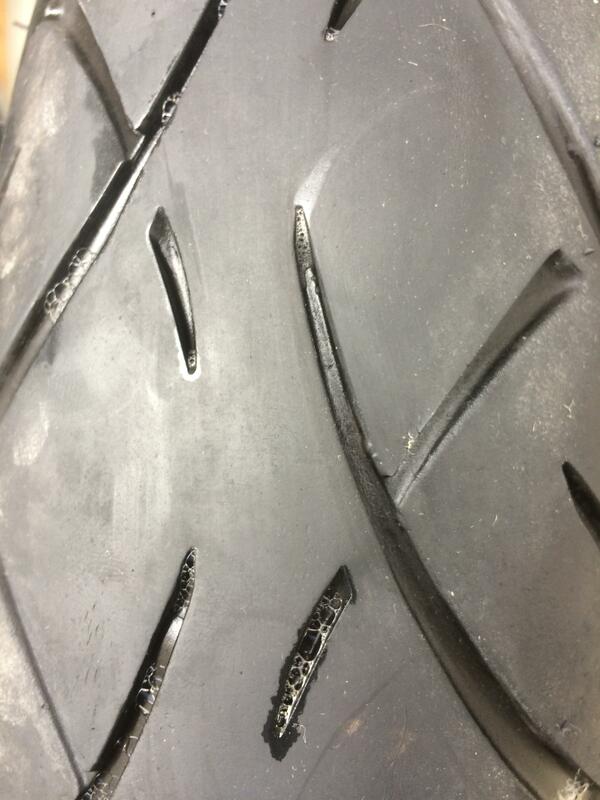 The front tire has always held air well. It might lose 1-2 psi a month and most of that is from checking the pressure. The volume of air is so small that it is easy to lose 1/2 psi just checking the pressure given how hard it is to get the tire gauge square on the stem with the disks so close to the rim. 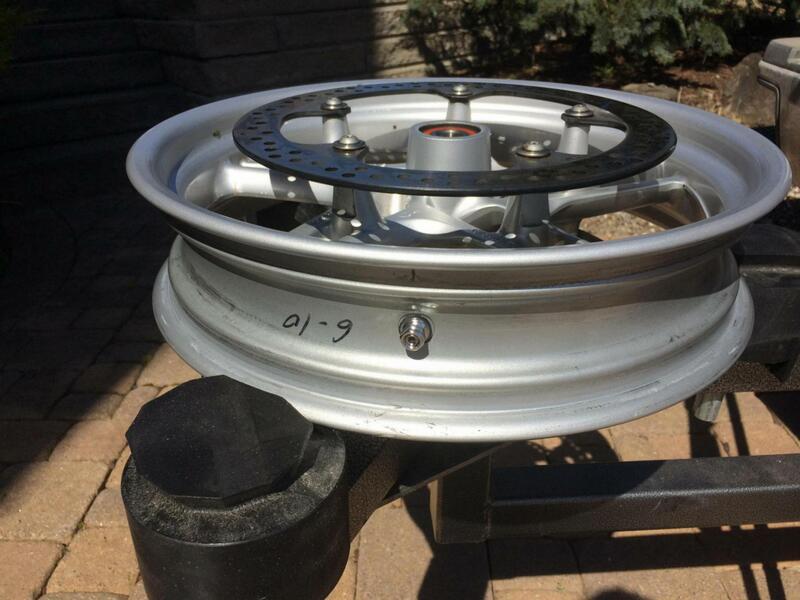 You say you have carefully worked over the bead area of your wheels and suspect some porosity in the wheel. This can happen. I agree the next thing is to coat the inside of the wheels. I suggest that you clean your wheel interior with some progressively nasty solvents and scotchguard (and gloves). I would start with 3M automotive adhesive remover to get all the bits of gunk off, especially the beads. Then a good wash of the interior with dome carb cleaner spray. Let dry well for a while and then paint/rub down completely with Loctite 290. It will penetrate any porosity. Of course allow no build up in bead area. Finding a small leak 5/10 psi a month is not easy. Soap might not do it. Specialty leak detectors like "Snoop" really help then it is staring for minutes at each area. I found a leak on a wheel that had been driving the owner nuts for a couple of years. It took a half hour of careful inspection with a quality leak solution. It was bead area corrosion. 1973 Harley FLH 96 c.i. 1948 Harley EL 88 c.i. I change my own tires and these sealants generally make that a messy job. I am not that desperate yet, but may get to that point. I will first try sealing of the rim. GM and others have information on that as some cars are similarly afflicted. Next I will try a bead sealant. I suspect one or the other of these will cure the slow leak in my rear tire. I checked my front tire after 24 hours and it was down only 0.5 psi. The weird thing is that this tire carried me 8,500 miles around the US last fall losing only 2 psi the entire month and then goes flat over the winter sitting still. That suggests to me that it isn't the bead leaking, but might be the valve or possibly a very small puncture that I'm just not finding. I planned to ride this tire to Russelville and back, but may have to reconsider. It has nearly half its tread left so I hate to trash it. I had a friend paint the inside of a his wheels with Green loctite so he could run tubeless tires on ....as I remember 80's snowflake wheels. They were porous and you had to run tubes in them... That was 30 years ago, but it worked for him. He was a truck mechanic & had a pail of loctite to work with..
Locktite is probably a great solution, but pretty pricey for "painting" a large area. I am thinking about trying a silver paint. I had a problem keeping pressure as well. I think its because my rims are scratched up pretty good. 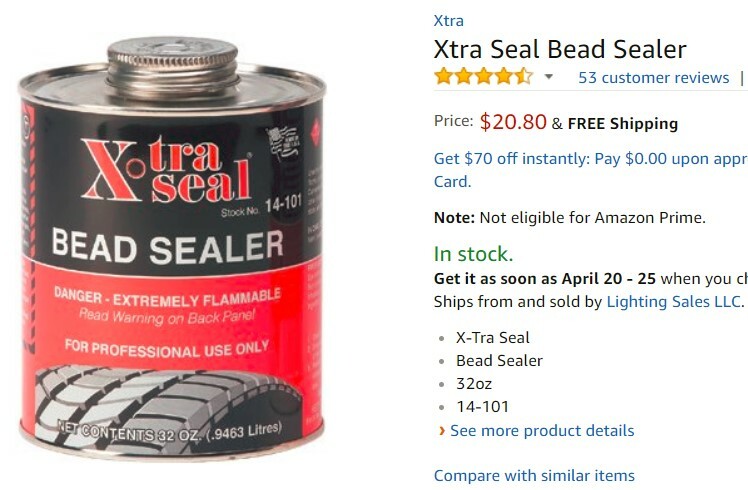 Ever since I started using this stuff when I change tires I've had no issues. I was looking at exactly this stuff just last night. Wishing I could find a smaller quantity, but this amount would certainly last a long time! There are a lot of tire issues but I promise you that if you pull the wheel off,(rim and tire attached together) and stick it in a bucked of water that you will know where your leak is coming from. I don't have any buckets that big. Will have to use the Jacuzzi. I gave the front wheel a thorough visual inspection and then a soapy water bath and found nothing. I hate to submerge the front wheel as I don't like soaking the bearings and getting the hub internals wet. 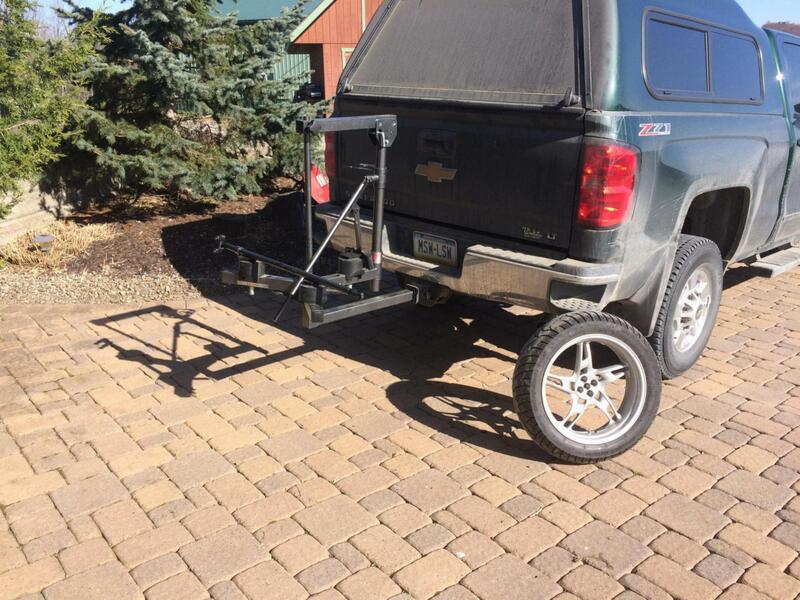 The rear wheel is not a problem. Fortunately, it has been the rear wheels that have the slow leaks. My current front tire issue is unlikely to be the rim. I suspect tire or valve. If you do use the Jacuzzi, make sure you don't turn it on. Would make it difficult to distinguish between its bubbles and ones coming from the tire. Walk up ( or drive) to your local tire store and use their bucket. Have you tried over inflating it to like 60 PSI during the testing? Not yet. It has lost only 2 psi in three days. If I ride it a few miles and this rate holds, I will ride it to Arkansas and just try to wear it out and inspect the wheel closely when I mount the next tire. When I found a leak this small on a wheel, I was wearing those headband flip down magnifiers and using a high quality leak bubble solution. I'm not sure if the normal tank dipping format will work out. I tend to think you're right. Less than 1 psi per day from a relatively small volume tire isn't much air. However, if it doesn't get worse, I can live with it until this 888 is worn out. Probably be done by the end of the year. Well, I think I have uncovered most of my tire pressure issues. I was checking the rear pressure and I seemed to have a hard time getting the gauge to seal on the valve stem. Then I felt some air on my thumb that seemed to be coming from the base of the stem. I then wiggled it and it moved side to side letting air escape each direction. That may be part of why I lost air on my trip. I can see hard bumps possibly jiggling the loose stem and letting small bursts of air. I've never had an issue before with the Kurvey Girl stubby metal valves. I believe they are double nutted on the inside, but apparently this one worked loose. 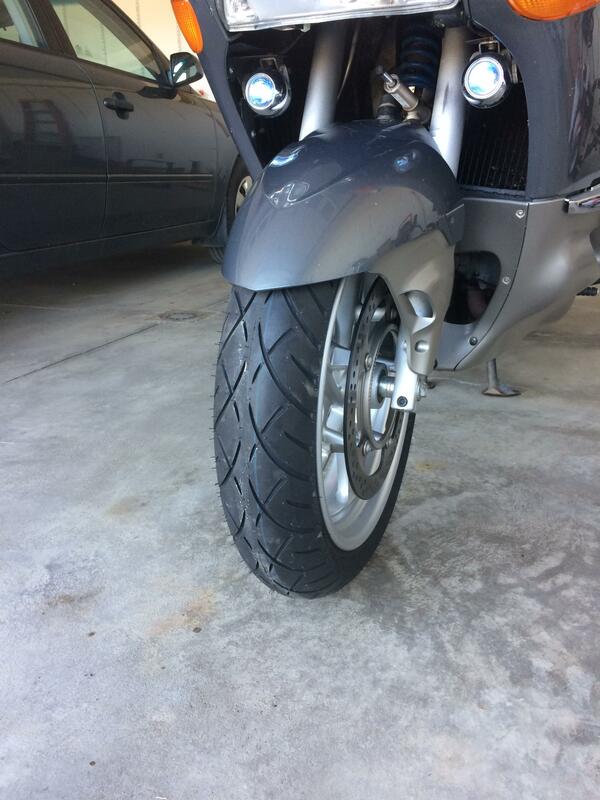 Fortunately, I have a 50% tread tire on my spare rear wheel that will easily get us to CCR and back. And probably to BWOM-10 at Tail of the Dragon in June. As for the front, I spent some quality time today slowing spinning the wheel and spraying it with soapy water and carefully watching for bubbles. Never found a single hint of leakage. Decided to spin the tire and check the rim for dents or bead damage. Again nothing. I then lowered the floor jack to raise the rear wheel to change it as mentioned already. When I came back to the front I decided I might as well wipe down the front wheel since it was well covered in soapy water. As I spun the wheel it stopped abruptly. I pulled and it began to rotate, but again stopped quickly. I noted the spot and did it again and it stopped at the same spot. I had serendipitously lowered the front to where the front tire cleared the slab except at the high spot in the tire. 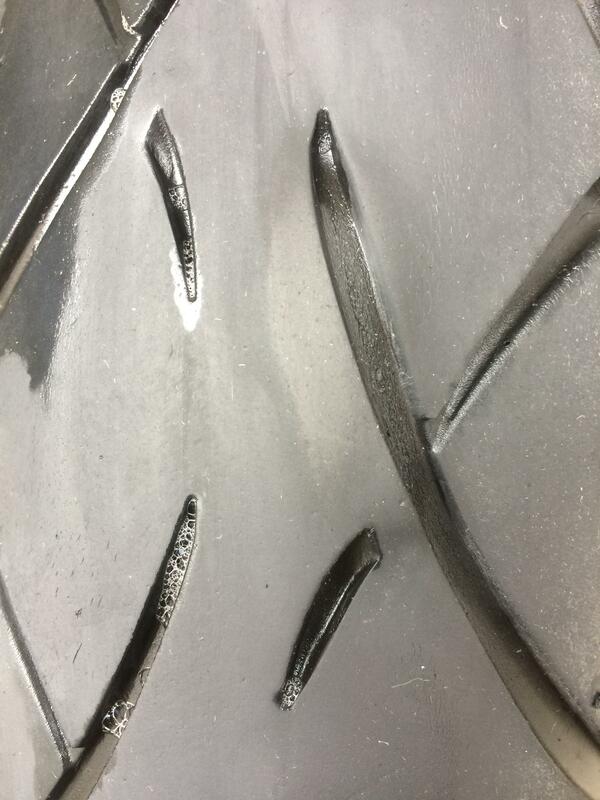 A closer look showed a pronounced bulge just off-center in the tread. See attached pictures. Then, as the now pretty clean tire dried, I noticed another dimple in the tread. I think it is hardware, but it may be a cactus thorn from my desert trip. I can't detect any leak, but it certainly is not to be ignored. 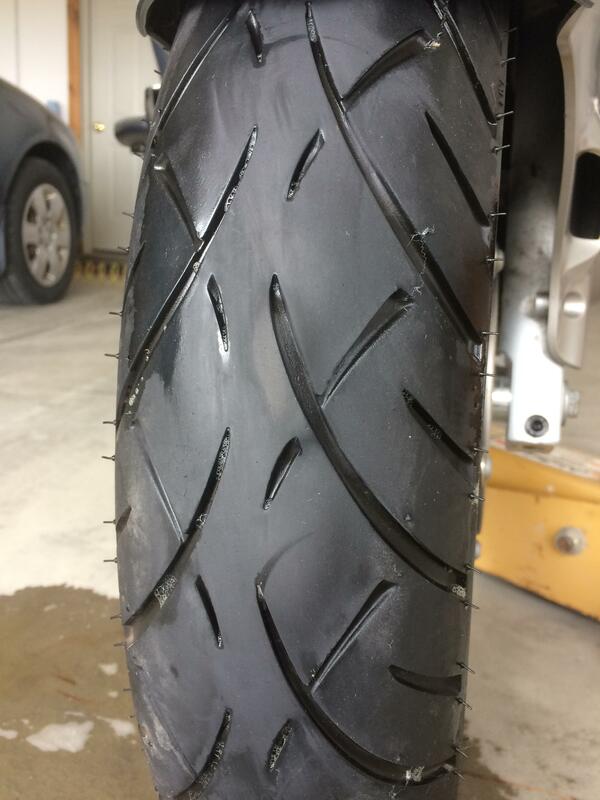 So, a new tire is on the way. So, I will have a new front shoe for CCR. I had a bubble sort of like that on an ME 880 front that I noticed as I was getting read to replace it. It didn't leak either but I was glad I was replacing it. My new tire arrived yesterday. AMT is fast. I ordered last Saturday. They will submit old tire to Metz for warranty review. I had 9,000 miles on it so I don’t expect much. This is the second failure of a made in Brazil Metz after 4 good German made ones. So far no failures of the Brigdestones. Since it is 86 here today (snowed last Sunday), I decided to git’ER done. I fixed the loose rear valve stem on the rear wheel and added a light coat of bead sealer to the valve stem seals. That is messy stuff. Put it on the remounted rear also and the new front, but not sure I got a uniform coat. Very hard to hold the stiff tires down with one hand and apply sloppy goop with the other. Probably should have had a second pair of hands. I also found the front stem a little loose so I tightened it, but didn’t remove it to goop the seals. Must be thermal cycling and vibration that loosened them over the 6 or so years I’ve had them, even double nutted. May have to use thread locker if they loosen again. Many years ago a car co. 'painted' their differential cases with wicking Locktite because of oil leaks due to casting porosity. 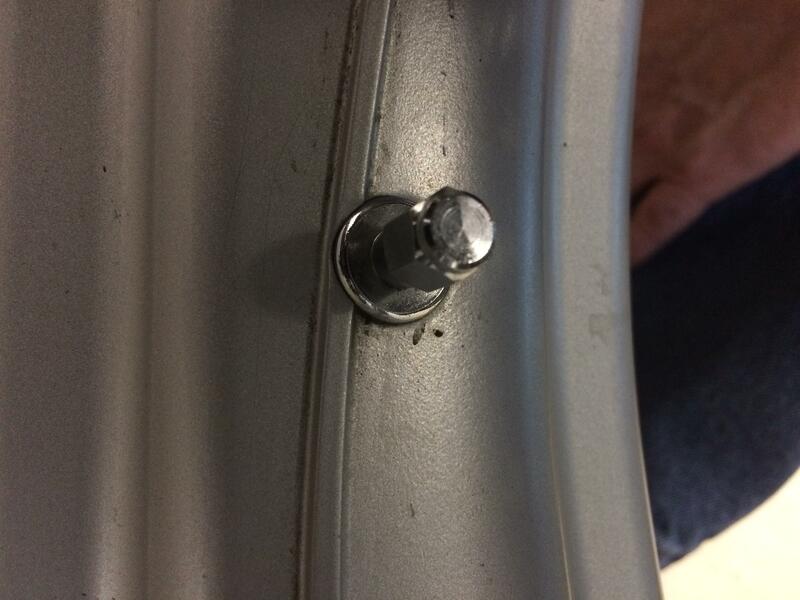 If you are using aftermarket metal valve stems, some bmw rims have a rib or the casting shape is dome metal there the stem outer nut goes to secure the stem. This area needs to be filed flat, if not the stem can move sideways with normal air addition and gauging. This will loosen the stem. I recommend staying with German rubber valves if this is the case. I bought the Kurvey Girl stems because I had read here or somewhere that they fit the LT wheels without modification of the wheels. This seems to be the case as the metal collar just fits inside the rib ends. They came with no torque spec and I did not want to over tighten and crush the rubber seals. I suspect I didn't tighten them enough or didn't tighten the jam nut enough. They held for six years. Just need to check them at each tire change in the future and use Loctite should they loosen again. Hope that your air leaks are now fixed! Nice tire changer. What brand and where did you get that? NoMar bought online. Once you learn the technique, it works great. The key is to follow their instructions precisely. The first time I was unable to install the stiff LT tires with their mount bar. They show an alternate technique using their long pry bars. I bought the bars and they work, but I found that my issue with the mount bar was trying to move too fast and not using their paste lube on the drop center. I tried using just a spray lube, but I think that was drying too fast. If the tire can't slide easily in the drop center, life gets hard. I now can mount the tires using just their mount bar. Lube the tire and rim per their videos using their paste lube. Use the mount bar, but don't rush it. Just bump it an inch with your hip and wait. You will see the tire relax as it slips around in the drop center. Bump the bar again and wait. A few iterations of this and the bead will slip over the rim. It takes a little effort to be sure, but you don't need to be the Incredible Hulk to make it work. Using too much muscle just twists the mount bar out of position and risks breaking a tip. Ask me how I know. I haven't broken a top yet, but I had a hard time keeping the mount bar from twisting at first. I was using too little lube, the wrong lube and trying to move the mount bar in one fast motion like a tire machine moves. That didn't work well. Much better to bump the bar with your hip and give the tire time to respond. And if at all possible, let the tires sit in the sun for an hour. This makes a huge difference.